Natural supplements for dogs are essential to promote and support growth and development, a healthy haircoat, a strong immune system, and so on. 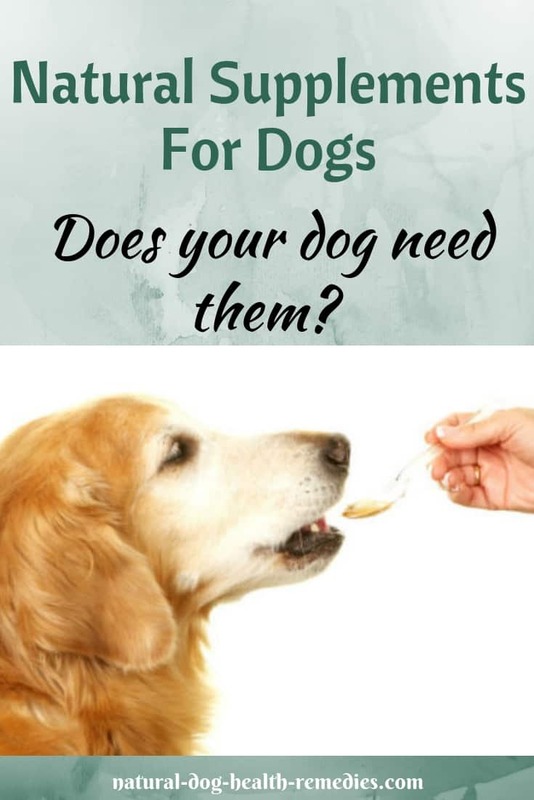 Many people mistakenly believe that if they feed their dogs a commercial dog diet, then all the essential nutrients are there in the food, and as such they do not have to give any vitamins or other supplements to their dogs. After all, commercial dog food is supposed to be "complete and balanced", right? The fact is, sadly, commercial pet food is depleted of a lot of essential nutrients, either due to poor quality, or because of the way the food is being processed. Why Supplements are Needed Even if the Dog Diet is Complete & Balanced? As you know, many nutrients are unstable when exposed to air and/or heat, and can easily be destroyed during food processing. For example, digestive enzymes and vitamins can be destroyed by heat. When the food is cooked or processed to over 118°F, enzymes are destroyed. Fatty acids can become rancid. In addition, fatty acids in commercial food tend to be high in Omega-6's and low in Omega-3's. It is therefore important that natural supplements are included as part of the dog's daily dietary routine - Don't wait until your dog is sick before you give him supplements! Even if you feed your dog a very high-quality home-made diet, certain supplements (such as antioxidants, vitamins and minerals, fatty acids, probiotics, etc.) are beneficial to the overall health and wellbeing of the dog. To help you understand a bit more about some beneficial natural supplements for dogs, I have put together several pages listed below, in alphabetical order. 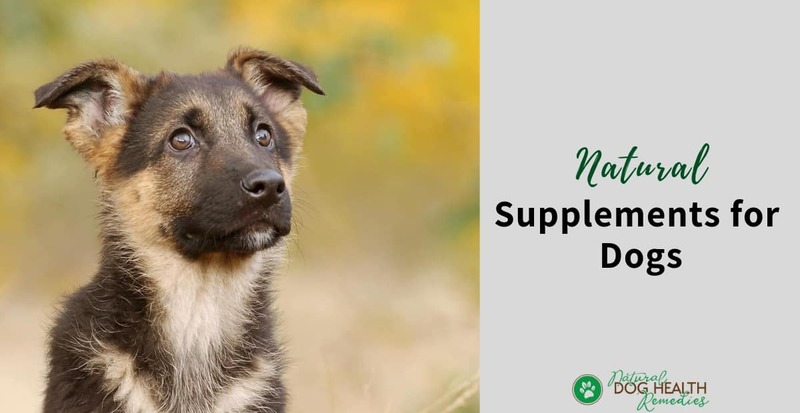 Please take the time to go over each page so that you can make a better-informed decision as to which supplement(s) your dog needs taking into consideration his age and health condition. ACV is one of the most useful supplements for dogs as it can give our dogs a lot of health benefits. It is anti-bacterial and anti-fungal, so it prevents infections caused by bacteria and fungus. ACV also supports and boosts the immune system. ACV can be used topically and orally, and is a "must-have" at home for dogs at all life stages. Antioxidants are some vitamins, minerals, and other chemical compounds that can stop cellular damage caused by free radicals. Vitamins A, C, and E, Carotenoids, Selenium, Coenzyme Q10, and Alpha Lipoic Acid (ALA) are all powerful antioxidants. Antioxidants can slow down the aging process and help prevent cancer. Older dogs and those with health problems such as cancer can benefit from supplementation of antioxidants. Coconut oil can be given orally to dogs as a supplement, and it can also be applied topically on the skin to treat dry itchy skin, lesions, ringworm, and so on. It has a lot of health benefits (both for humans and dogs), and since most dogs like the taste of coconut oil, supplementing is not a problem! CoQ10 is an antioxidant, and is also essential for all cells to produce energy for cell growth and maintenance. It is especially beneficial to dogs with heart problems, periodontal problems, and cancer. Older dogs cannot effectively convert CoQ10 to its active form (ubiquinol); it is therefore advisable to supplement older dogs with ubiquinol. Enzymes are special proteins that are essential for food digestion. However, as mentioned above, enzymes in food are easily destroyed or inactivated during food processing. It is therefore advisable to supplement dogs with digestive enzymes to help with food digestion. This is especially important for dogs with digestive issues such as colitis, IBD, chronic gastritis, and so on. Fatty acids (Omega-3 and Omega-6 are two FAs that are essential for dogs) are specific types of polyunsaturated fats. They are, however, unstable and can go rancid easily. Dogs of all ages can benefit from fatty acid supplementation, in particular Omega-3 FAs since most dog foods are low in them. Be sure to also read the article on fish oil vs flaxseed oil for dogs. If your dog is over 7 or if your dog is starting to show signs of joint pain, glucosamine is an essential supplement since its function is to maintain and regenerate healthy cartilage in joints. If glucosamine is depleted, degenerated joint problems such as osteoarthritis occurs. Grapefruit seed extract (GSE) has powerful antibiotic, antifunal, antiviral, anti-parasitic, and antioxidant properties. It can be safely used both topically and orally on dogs, for ear and skin infections, Candida yeast infections, and stomach problems caused by bacteria or virus. A must-have for dogs (and people)! Honey can be used orally for allergies and digestive problems, and it can also be applied topically to burns, wounds, hot spots, and other skin problems. Like coconut oil, honey has loads of health benefits for dogs (and people), and because it is sweet, most dogs have no problem with the taste. Kelp is the most nutritious of all sea vegetables. It is rich in minerals and trace elements and has a nourishing and tonic effect on all of the body's systems. Kelp contains over 60 minerals and trace elements, 21 amino acids, simple and complex carbohydrates and several essential plant growth hormones. Kelp supplies a natural source of minerals to a dog's body and minerals are essential in every aspect of a dog's health. Like glucosamine, MSM (Methyl-sulfonyl-methane) is one of the best natural supplements for dogs with joint problems. One of the most powerful natural supplements for dogs, probiotics are the "good bacteria" and are used to restore the normal balance of gut microflora (bacteria). They act as the body's first line of defence against all the potentially harmful bacteria and other microorganisms that your dog eats or inhales. Thus, having a constant supply of these friendly bacteria in your dog's GI tract can help prevent a wide range of health problems. Probiotic supplements are advisable for dogs at all life stages, but particularly for older dogs and those with chronic digestive problems, such as chronic diarrhea, colitis, IBD, and so on. Resveratrol is a powerful antioxidant and has anti-inflammatory and anti-cancerous properties. It may be one of the most important natural supplements for dogs who are aging and with weakened immunity.